Although it can present at any time, the peak incidence of disease is in the second and third decades of life. A male-to-female ratio of 2:1 is observed in North American and Western European populations, although this difference is not observed among populations in the Pacific. IgA nephropathy occurs with greatest frequency in Asians and whites and is relatively rare in blacks. In a Chinese study, IgA nephropathy constituted 45% of all cases of primary glomerulonephritis. However, IgA deposits may also be seen on kidney biopsy findings in individuals with no evidence of renal disease. The reported incidence rate of mesangial IgA deposition in apparently healthy individuals is 3-16%. These cases had no clinical features of nephritis, but their renal biopsy findings were consistent with IgA nephropathy. Spontaneous remission has been reported in children and adults. Secondary IgA nephropathy is also associated with various underlying disease processes. It was initially considered a benign condition, but extended follow-up indicates that IgA nephropathy does lead to significant kidney damage, and progressive disease develops in 20-30% of children 15-20 years after disease onset. Advanced age, hypertension, proteinuria, and impaired renal function at presentation are poor prognostic indicators. Mesangial deposits of immunoglobulin A (IgA). Fluoresceinated Anti-IgA Antibody, Immunofluorescence microscopy, original magnification 400x. Image courtesy of Patrick D Walker, MD. Immunoglobulin antibody A is a major serum immunoglobulin and the predominant antibody class in the external secretions that bathe mucosal surfaces. This plays a key role in immune protection. Indeed, the body expends considerable energy in producing IgA, such that the daily production of IgA exceeds that of all the other antibody classes combined. IgA, at concentrations of about 2-3 mg/mL, is the second most prevalent antibody in serum after IgG, which is normally present at about 12 mg/mL. Because serum IgA is metabolized 5 times faster than IgG, the production rates of serum IgA and IgG must be similar. Serum IgA is predominantly monomeric in nature; the secretory IgA (S-IgA) is chiefly polymeric, comprising mainly dimeric forms of IgA containing the J (joining) chain. S-IgA serves various functions to protect the vast surface area (approximately 400 m2) occupied by mucosal surfaces, such as the linings of the respiratory, GI, and genitourinary tracts. As the major class of antibody present at these sites, S-IgA can be considered an important first line of defense against many invading pathogens. The galactose-deficient IgA, through interaction with RR Fc alpha/gamma, may activate circulating lymphocytes and monocytes and enhance their response to chemoattractants produced by the mesangial cell, thus causing the inflammatory infiltrate to initiate and maintain the interstitial injury. Aberrant O-galactosylation has been found in serum IgA1, in IgA1 isolated from tonsillar lymphocytes, and in IgA1 eluted from mesangial deposits. Evidence suggests that changes in IgA1 O-galactosylation lead to IgA immune complex formation and mesangial IgA deposition. Mesangial cells exposed to these IgA immune complexes proliferate and adopt a proinflammatory phenotype; they secrete cytokines, chemokines, growth factors, and extracellular matrix components, promoting glomerular inflammation and glomerulosclerosis. Clinical onset is frequently heralded by synpharyngitic hematuria, macroscopic hematuria during an upper respiratory tract infection. Clinical and laboratory data support a postulated extrarenal origin of the glomerular IgA1, likely derived from circulating immune complexes containing polymeric IgA1, deficient in galactose in the hinge-region O-glycans, bound by antiglycan antibodies. The galactose deficiency affects IgA1 induced by mucosal antigens and elevated circulating levels of this abnormal IgA1 are hereditable, suggesting interactions of genetic and environmental factors. Recurrence of IgA nephropathy has been reported in allograft, and rapid disappearance of IgA deposits is observed when kidneys with IgA deposits are transplanted in a patient without IgA nephropathy. In the next few years, advances recently added to the knowledge of the pathogenesis of nephropathy IgA1 could provide new variables that may allow classification of patients based not only on clinical and morphological criteria but also on a greater understanding of the pathogenic basis. IgA nephropathy and HSP share many morphologic and immunopathologic features. The most striking similarities between IgA nephropathy and HSP nephropathy (HSN) are mesangial IgA deposition, elevated serum IgA level, and IgA circulating immune complexes. The glomerular changes (diffuse or focal mesangial proliferation) in HSN are essentially the same as those in IgA nephropathy. An infective episode precedes HSN in 30-50% of patients, and the presence of Haemophilus influenzae antigen in the glomerular mesangium and the presence of IgA antibody against H influenzae in sera have been reported in patients with HSN. Both have broadly similar geographic distributions and are rare in black persons. Coexistence in different members of the same family has been reported. Both can be encountered consecutively in the same patient. They have been described in twins, and they bear identical pathological and biological abnormalities. Kidney biopsy does not reveal any differences between the 2 conditions. A Working Group of the International IgA Nephropathy Network and the Renal Pathology Society have developed a consensus on the pathologic classification of IgA nephropathy. The goal of the new classification was to identify specific pathological features that more accurately predict risk of progression of renal disease in IgA nephropathy. Clinical data and adequate renal biopsy material from 265 patients with IgA nephropathy were collected from 8 countries on 4 continents. Five centers from Asia, 6 from Europe, 2 from United States, 1 from South America, and 2 multicenter networks (Canada and the United States) participated in the study. The proportion of children was similar in each continent (approximately 30%). These patients were followed for a median of 5 years. 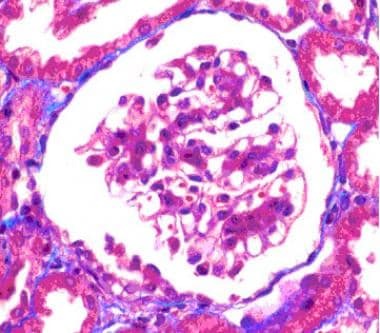 Glomerulus with mesangial hypercellularity and intact capillary loops. Trichrome Stain, original magnification 400x. Image courtesy of Patrick D Walker, MD. Mesangial cells are counted per mesangial area and a score of 0-3 is assigned for each glomerulus. A score of 0 indicates that fewer than 4 mesangial cells are present per mesangial area; a score of 1 indicates that 4-5 mesangial cells are present per mesangial area; a score of 2 indicates that 6-7 mesangial cells are present per mesangial area; and a score of 3 indicates that greater than 8 mesangial cells are present per mesangial area. Scores obtained for all glomeruli are averaged, and the resulting assigned hypercellularity score is either M0 if the mean score is less than 0.5 or M1 if the mean score is greater than 0.5. Segmental glomerulosclerosis is defined as present (S1) if any part of the glomerular tuft is involved in sclerosis or absent (S1) if no segmental glomerulosclerosis is present. Endocapillary hypercellularity is defined as present (E1) if hypercellularity is present within the glomerular capillary lumina and results in narrowing of the lumina or absent (E0) if no hypercellularity is present within lumina. The percentage of the cortical area involved by tubular atrophy or interstitial fibrosis is quantitated. A score of T0, T1, or T2 is given if the percentage of involved cortical area is 0-25%, 26-50%, or more than 50%, respectively. Biopsies with fewer than 8 glomeruli should be considered of uncertain value for prognosis. IgA nephropathy accounts for 5-10% of all primary glomerular diseases occurring in the United States. The prevalence of IgA nephropathy in the general population has been estimated to be about 25-50 cases per 100,000 population. Almost 5% of all biopsied patients have at least some IgA deposits in their glomeruli. The incidence of end-stage renal disease (ESRD) due to IgA nephropathy was 5.5 cases per million population per year; about 8.4 cases for males and 2.7 cases for females. IgA nephropathy has been diagnosed worldwide, but its prevalence in different countries varies. In Pacific countries, particularly in Japan, it accounts for approximately 50% of all primary glomerular diseases. In Europe, it is responsible for 20-30%. The explanation of this apparent variability is uncertain but may be related, in part, to differing indications for renal biopsy in different centers. High incidence rates are reported in Asia, France, Italy, Finland, and southern Europe. Genetic and environmental factors may contribute to geographic differences in prevalence. Population studies in Germany and France have calculated an incidence of 2 cases per 10,000, although autopsy studies performed in Singapore suggest that 2-4.8% of the population may have IgA deposition in their glomeruli. In the United Kingdom, Canada, and the United States, it is common practice not to recommend renal biopsy for patients presenting with isolated hematuria or mild proteinuria; examination of renal tissue is reserved for those in whom increasing proteinuria or worsening renal function develops. Such reluctance to perform biopsies inevitably reduces the number of cases of IgA nephropathy reported in the general populations of these countries. Although IgA nephropathy was thought to carry a relatively benign prognosis, an estimated 1-2% of all patients with IgA nephropathy develop end-stage renal failure each year from the time of diagnosis. In a study of 1900 patients derived from 11 separate series, the long-term renal survival was estimated to be 78-87% within a decade of presentation. Similarly, European studies have suggested that renal insufficiency may occur in 20-30% of patients within 2 decades of the original presentation. In a study from Hong Kong, patients with mild IgA nephropathy were prospectively followed. Significant proteinuria or renal insufficiency was found in numerous patients, suggesting that a significant risk of progression is present, even in patients who present with milder forms of disease. Several studies have assessed features that predict a poor prognosis. Sustained hypertension, persistent proteinuria (especially proteinuria >1 g), impaired renal function, and the nephrotic syndrome constitute poor prognostic markers. Typically, mortality associated with IgA nephropathy is secondary to renal failure or its complications. Morbidity may be subsequent to hypertension, electrolyte abnormalities, or other consequences of reduced renal function. Familial IgA nephropathy has an increased risk of end-stage renal disease. The distribution of IgA nephropathy varies in different geographic regions throughout the world. It is the most common form of primary glomerular disease in Asia, accounting for as much as 30-40% of all biopsy findings, for 20% of biopsies in Europe, and for 10% of all biopsies performed for glomerular disease in North America. The reason for this wide variance in incidence is partly attributable to indications for renal biopsy in Asia compared to those in North America. In the United States, incidence of IgA nephropathy is increased in children who are Asian or white; incidence is lowest in blacks. Incidence is higher in males than in females. Male-to-female ratios of 2:1 and 6:1 have been reported. IgA nephropathy occurs in persons of all ages but is still most common in the second and third decades of life and is much more common in males than females. IgA nephropathy is uncommon in children younger than 10 years. In fact, 80% of patients are between the ages of 16-35 years at the time of renal biopsy. D'Amico G. Natural history of idiopathic IgA nephropathy and factors predictive of disease outcome. Semin Nephrol. 2004 May. 24(3):179-96. [Medline]. Li LS; Liu ZH. Epidemiologic data of renal diseases from a single unit in China: analysis based on 13,519 renal biopsies. Kidney Int. 2004 Sep. 66(3):920-3. [Medline]. Novak J, Julian BA, Mestecky J, Renfrow MB. Glycosylation of IgA1 and pathogenesis of IgA nephropathy. Semin Immunopathol. 2012 May. 34(3):365-82. [Medline]. Segarra A. [Progress in understanding the pathogenesis of IgA nephropathy: new perspectives for the near future?]. Nefrologia. 2010. 30(5):501-7. [Medline]. Narita I, Gejyo F. Pathogenetic significance of aberrant glycosylation of IgA1 in IgA nephropathy. Clin Exp Nephrol. 2008 Oct. 12(5):332-8. [Medline]. Suzuki H, Kiryluk K, Novak J, et al. The pathophysiology of IgA nephropathy. J Am Soc Nephrol. 2011 Oct. 22(10):1795-803. [Medline]. Yu HH, Chu KH, Yang YH, et al. Genetics and immunopathogenesis of IgA nephropathy. Clin Rev Allergy Immunol. 2011 Oct. 41(2):198-213. [Medline]. Novak J, Moldoveanu Z, Julian BA, et al. Aberrant glycosylation of IgA1 and anti-glycan antibodies in IgA nephropathy: role of mucosal immune system. Adv Otorhinolaryngol. 2011. 72:60-3. [Medline]. [Guideline] Cattran DC, Coppo R, Cook HT, et al. The Oxford classification of IgA nephropathy: rationale, clinicopathological correlations, and classification. Kidney Int. 2009 Sep. 76(5):534-45. [Medline]. Lai FM, Szeto CC, Choi PC, et al. Characterization of early IgA nephropathy. Am J Kidney Dis. 2000 Oct. 36(4):703-8. [Medline]. Grewal SK, Wan J, Denburg MR, Shin DB, Takeshita J, Gelfand JM. The risk of IgA nephropathy and glomerular disease in patients with psoriasis: a population-based cohort study. Br J Dermatol. 2016 Aug 12. [Medline]. Glassock RJ. 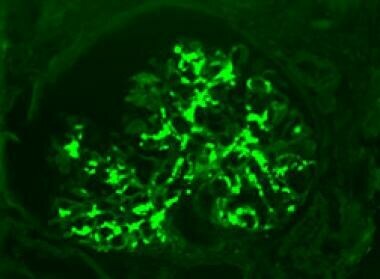 Analyzing antibody activity in IgA nephropathy. J Clin Invest. 2009 Jun. 119(6):1450-2. [Medline]. [Full Text]. Hasbargen JA, Copley JB. Utility of skin biopsy in the diagnosis of IgA nephropathy. Am J Kidney Dis. 1985 Aug. 6(2):100-2. [Medline]. Fabiano RC, de Almeida Araújo S, Bambirra EA, Oliveira EA, Simões E Silva AC, Pinheiro SV. Mesangial C4d deposition may predict progression of kidney disease in pediatric patients with IgA nephropathy. Pediatr Nephrol. 2017 Feb 23. [Medline]. Berthoux F, Mohey H, Laurent B, Mariat C, Afiani A, Thibaudin L. Predicting the risk for dialysis or death in IgA nephropathy. J Am Soc Nephrol. 2011 Apr. 22(4):752-61. [Medline]. [Full Text]. Reich HN, Troyanov S, Scholey JW, Cattran DC. Remission of proteinuria improves prognosis in IgA nephropathy. J Am Soc Nephrol. 2007 Dec. 18(12):3177-83. [Medline]. Kunz R, Friedrich C, Wolbers M, Mann JF. Meta-analysis: effect of monotherapy and combination therapy with inhibitors of the renin angiotensin system on proteinuria in renal disease. Ann Intern Med. 2008 Jan 1. 148(1):30-48. [Medline]. Donadio JV Jr, Larson TS, Bergstralh EJ, Grande JP. A randomized trial of high-dose compared with low-dose omega-3 fatty acids in severe IgA nephropathy. J Am Soc Nephrol. 2001 Apr. 12(4):791-9. [Medline]. [Full Text]. Appel GB, Waldman M. The IgA nephropathy treatment dilemma. Kidney Int. 2006 Jun. 69(11):1939-44. [Medline]. Floege J, Eitner F. Present and future therapy options in IgA-nephropathy. J Nephrol. 2005 Jul-Aug. 18(4):354-61. [Medline]. Manno C, Torres DD, Rossini M, Pesce F, Schena FP. Randomized controlled clinical trial of corticosteroids plus ACE-inhibitors with long-term follow-up in proteinuric IgA nephropathy. Nephrol Dial Transplant. 2009 Dec. 24(12):3694-701. [Medline]. Ballardie FW, Roberts IS. Controlled prospective trial of prednisolone and cytotoxics in progressive IgA nephropathy. J Am Soc Nephrol. 2002 Jan. 13(1):142-8. [Medline]. Tumlin JA, Lohavichan V, Hennigar R. Crescentic, proliferative IgA nephropathy: clinical and histological response to methylprednisolone and intravenous cyclophosphamide. Nephrol Dial Transplant. 2003 Jul. 18(7):1321-9. [Medline]. Maes BD, Oyen R, Claes K, et al. Mycophenolate mofetil in IgA nephropathy: results of a 3-year prospective placebo-controlled randomized study. Kidney Int. 2004 May. 65(5):1842-9. [Medline]. Tang SC, Tang AW, Wong SS, Leung JC, Ho YW, Lai KN. Long-term study of mycophenolate mofetil treatment in IgA nephropathy. Kidney Int. 2010 Mar. 77(6):543-9. [Medline]. Frisch G, Lin J, Rosenstock J, Markowitz G, et al. Mycophenolate mofetil (MMF) vs placebo in patients with moderately advanced IgA nephropathy: a double-blind randomized controlled trial. Nephrol Dial Transplant. 2005 Oct. 20(10):2139-45. [Medline]. Cattran DC. Current status of cyclosporin A in the treatment of membranous, IgA and membranoproliferative glomerulonephritis. Clin Nephrol. 1991. 35 Suppl 1:S43-7. [Medline]. Béné MC, Faure GC, Hurault de Ligny B, de March AK. Clinical involvement of the tonsillar immune system in IgA nephropathy. Acta Otolaryngol Suppl. 2004 Dec. 10-4. [Medline]. Xie Y, Chen X, Nishi S, Narita I, Gejyo F. Relationship between tonsils and IgA nephropathy as well as indications of tonsillectomy. Kidney Int. 2004 Apr. 65(4):1135-44. [Medline]. Rasche FM, Schwarz A, Keller F. Tonsillectomy does not prevent a progressive course in IgA nephropathy. Clin Nephrol. 1999 Mar. 51(3):147-52. [Medline]. Coppo R, Roccatello D, Amore A, et al. Effects of a gluten-free diet in primary IgA nephropathy. Clin Nephrol. 1990 Feb. 33(2):72-86. [Medline]. Rostoker G, Desvaux-Belghiti D, Pilatte Y, et al. High-dose immunoglobulin therapy for severe IgA nephropathy and Henoch-Schönlein purpura. Ann Intern Med. 1994 Mar 15. 120(6):476-84. [Medline]. Krebs S, Omer B, Omer TN, Fliser D. Wormwood (Artemisia absinthium) for poorly responsive early-stage IgA nephropathy: a pilot uncontrolled trial. Am J Kidney Dis. 2010 Dec. 56(6):1095-9. [Medline]. Kamei K, Nakanishi K, Ito S, Ishikura K, Hataya H, Honda M, et al. Risk factors for persistent proteinuria after a 2-year combination therapy for severe childhood IgA nephropathy. Pediatr Nephrol. 2015 Jun. 30 (6):961-7. [Medline]. Abe S. Pregnancy in IgA nephropathy. Kidney Int. 1991 Dec. 40(6):1098-102. [Medline]. Choy BY, Chan TM, Lai KN. Recurrent glomerulonephritis after kidney transplantation. Am J Transplant. 2006 Nov. 6(11):2535-42. [Medline]. Odum J, Peh CA, Clarkson AR, et al. Recurrent mesangial IgA nephritis following renal transplantation. Nephrol Dial Transplant. 1994. 9(3):309-12. [Medline]. Ponticelli C, Traversi L, Feliciani A, Cesana BM, Banfi G, Tarantino A. Kidney transplantation in patients with IgA mesangial glomerulonephritis. Kidney Int. 2001 Nov. 60(5):1948-54. [Medline]. Geddes CC, Rauta V, Gronhagen-Riska C, Bartosik LP, Jardine AG, Ibels LS. A tricontinental view of IgA nephropathy. Nephrol Dial Transplant. 2003 Aug. 18(8):1541-8. [Medline]. Szeto CC, Lai FM, To KF, et al. The natural history of immunoglobulin a nephropathy among patients with hematuria and minimal proteinuria. Am J Med. 2001 Apr 15. 110(6):434-7. [Medline]. Wakai K, Kawamura T, Endoh M, et al. A scoring system to predict renal outcome in IgA nephropathy: from a nationwide prospective study. Nephrol Dial Transplant. 2006 Oct. 21(10):2800-8. [Medline]. Alamartine E, Sabatier JC, Berthoux FC. Comparison of pathological lesions on repeated renal biopsies in 73 patients with primary IgA glomerulonephritis: value of quantitative scoring and approach to final prognosis. Clin Nephrol. 1990 Aug. 34(2):45-51. [Medline]. Rekola S, Bergstrand A, Bucht H. Deterioration of GFR in IgA nephropathy as measured by 51Cr-EDTA clearance. Kidney Int. 1991 Dec. 40(6):1050-4. [Medline]. Donadio JV, Bergstralh EJ, Grande JP, Rademcher DM. Proteinuria patterns and their association with subsequent end-stage renal disease in IgA nephropathy. Nephrol Dial Transplant. 2002 Jul. 17(7):1197-203. [Medline]. Electron photomicrograph showing mesangial electron dense deposits (arrow). Uranyl acetate and lead citrate stain, original magnification 12,000x. Image courtesy of Patrick D Walker, MD. Disclosure: Received income in an amount equal to or greater than $250 from: Alexion Pharmaceuticals; Horizon Pharmaceuticals); ; Dicerna, Jannsen Pharmaceuticals.